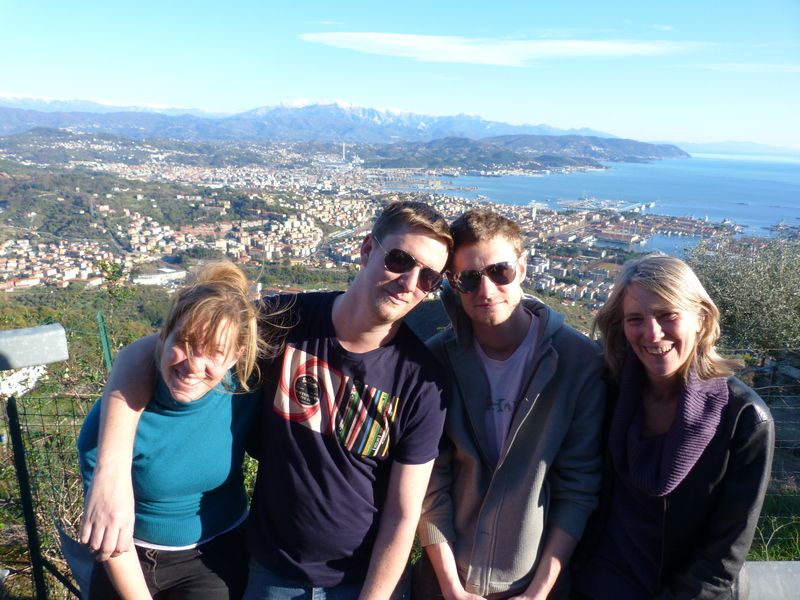 Before coming to Italy, we warned ourselves that the end of December would be wintery and cold. We were prepared for grey rain, but decided that the weather didn’t really matter. 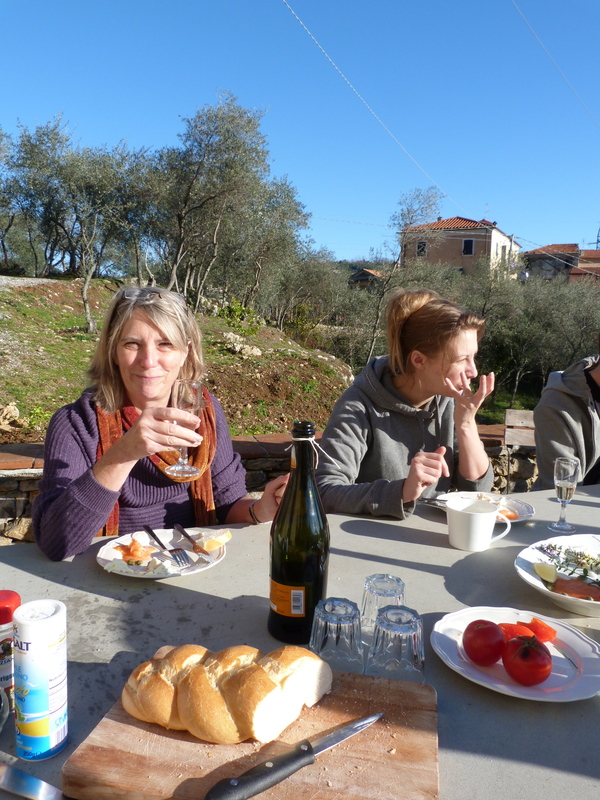 We thought it would be fun just to be together, eating wonderful Italian food and drinking local wines. 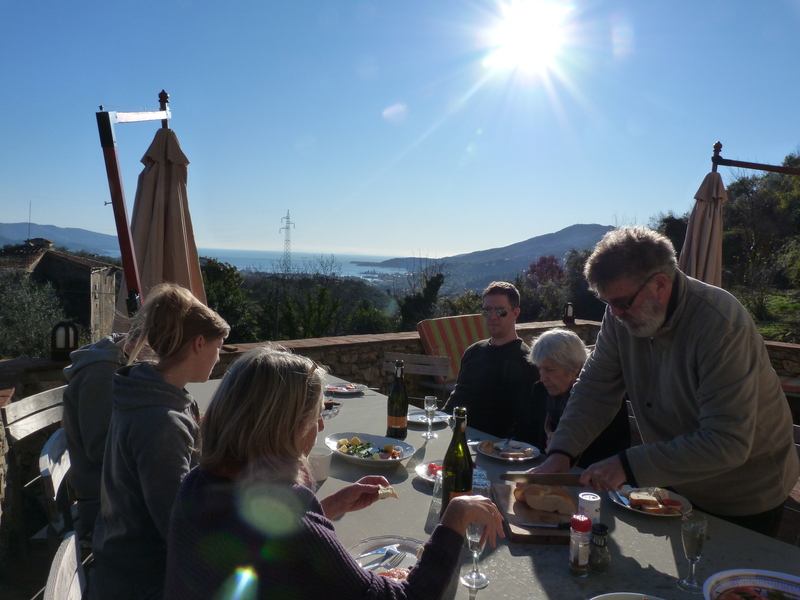 What we had not expected were hot sunny days, breakfasts and lunches on the terrace and long walks on the hillsides. Christmas Day broke with a thunderously beautiful sunrise. Unbelievably, it was warm enough for us to have our Prosecco, bread, cheese and smoked salmon sitting out on the terrace overlooking the sea. Church bells chimed as we launched into our Panatone. The villa is right beside the AVG, “Antica Via del Golfo”, a centuries old trail that connects surrounding towns and villages. 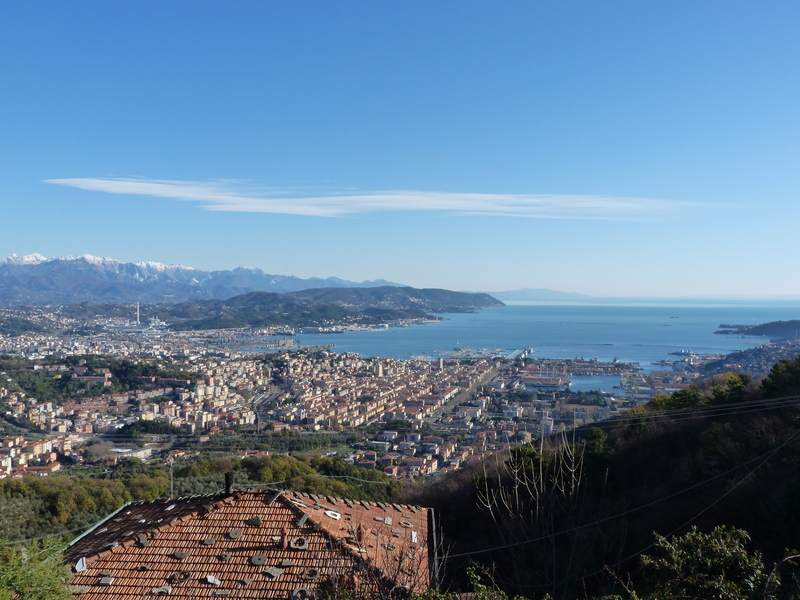 Walking down it, we can get to La Spezia in about 15 minutes. Walking up takes a lot longer, and is brutal on the thigh muscles. It is really steep. But when we are on the path we invariably meet someone much older than us walking comfortably, not breathlessly panting as we are. We’re always greeted by a cheery buon giorno, or buona sera. So walk up we do, as often as possible, if only to save face and justify the huge quantities of food we can not resist eating. The AVG also gives a unique opportunity to hike up the mountain and explore remote villages with breathtaking views. The path crosses a zig zag road with hairpin turns, clearly beloved of Italian drivers. It is the kind of road that Italian movies make famous. But walking the path gives you time to explore and see the pace of other people’s lives. On Christmas morning we headed up, unsure of where it would take us but mostly just wanting an excuse to walk and talk in the sunshine. We walked higher and higher up the mountain, surrounded by a feeling of celebration and the joy of being alive. We may see each other all together only once a year, but we know how to reconnect quickly, on a mountain top.